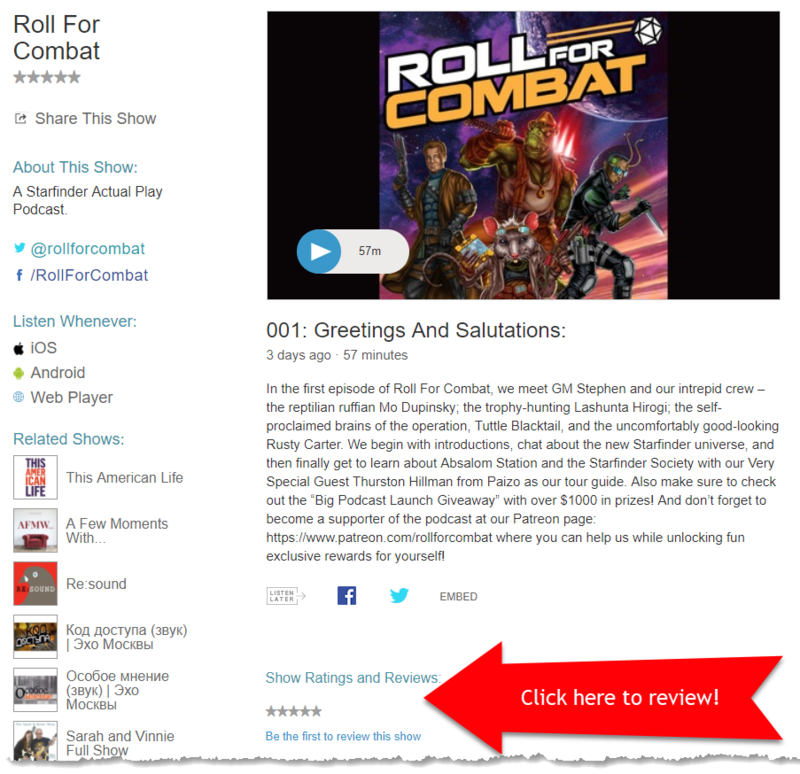 Jason recaps the events from Roll For Combat, Episode 001: Greetings And Salutations. We thought it might be fun to have a little post-episode blogging as a means of sparking some conversation and diving into issues that came up during the episode in a little more detail. Think of it like Talking Dead, but without Chris Hardwick’s fascination with skinny jeans. The first thing I noticed is that I forgot to share my personal background with gaming, though if we’re being honest, it’s not that different from the other guys. My fascination with high fantasy started with the Rankin-Bass production of The Hobbit and my dad reading the Lord of the Rings books to my older brother and I as kids (mercifully, he did not try to sing along with the elf songs). From there, my brother and I (along with a group of neighborhood friends) discovered D&D and other TSR games somewhere in the late 70s or early 80s. We liked Top Secret quite a bit, were kind of indifferent toward Gamma World, and our one session of Boot Hill degenerated into absurdist farce because our GM decided to have an entire bar pick a fight with my one friend Chris (not RFC Chris) because he refused to buy a cowboy hat. Since then, I’ve been a lifelong gamer, and yes, I’m even attempting to convert my 13-year-old son – I have a fathers-and-sons game with a couple local friends and their kids. It was actually one of the last things Thirsty said that really resonated with me – the notion that this is all going to be new to us. I love playing Pathfinder, but there are times where you’ve played so much that it’s a little bit “paint-by-numbers” – oh, it’s undead, so break out the fire and holy water; oh, he has Spell X, that must mean he’s Class Y, and at least level Z. Even if you don’t verbalize it out loud, you start to meta-game whether you mean to or not. It’ll be really nice – if a little bit intimidating at times – to play in an environment that’s comparatively tabula rasa. Indeed, that was part of how I ended up creating Tuttle. When I first got a hold of the rules, Solarian was the class that caught my eye. If you haven’t picked the rules up, Solarians are a melee class that harness light (star) and dark (black hole) powers to create additional effects. 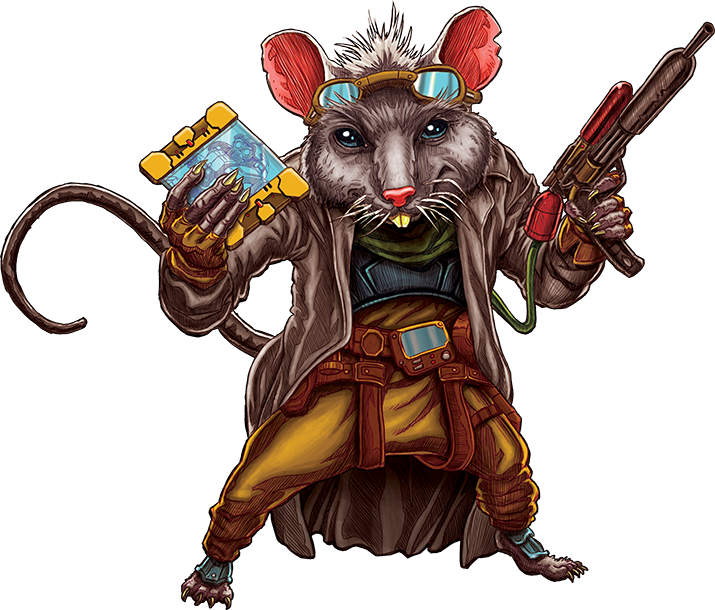 There’s no perfect Starfinder-to-Pathfinder translation, but a melee with spell powers like a magus or monk might be in the ballpark. I like casters and dual-wield rogues, and Solarian felt like it captured a lot of that. I’m pretty sure I called “dibs” on Solarian within 24 hours of reading the class description. But I found I wasn’t really coming up with a compelling character concept; after about a week, I had a set of stats attached to a Sentient Haircut. At best, my “character arc” was changing my race between Lashunta and Android a few times. So I decided to throw that character out and start from scratch with the notion that I was going to challenge myself to play something I hadn’t played before. 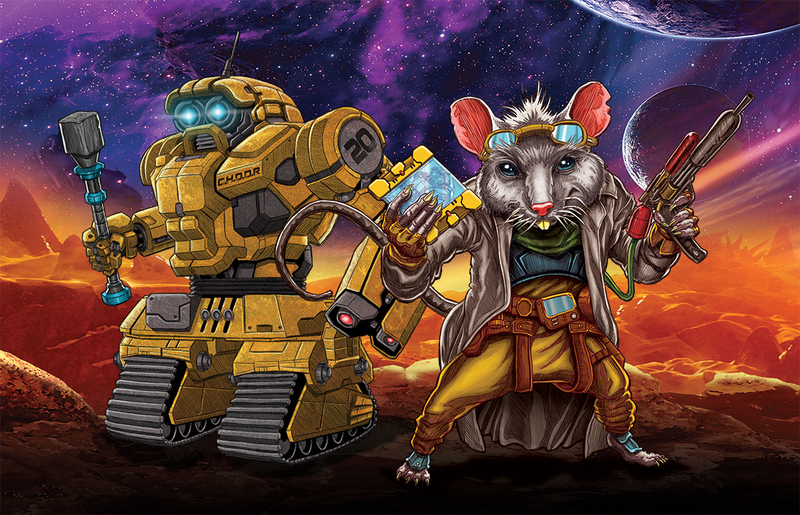 The Mechanic class leapt out from that standpoint, as playing a tech expert is just about the definition of embracing what’s new about Starfinder, and the drone seemed like an interesting game mechanic. The personality started to gel next – as I said on the podcast, the “tech guy with limited people skills” is a bit of an amalgam of multiple people I’ve met over the years. On good days, it’ll be matter-of-fact conversations about dissecting your brain after you die without understanding why that would be upsetting to the other person; on bad days, it’ll manifest as calling people stupid to their faces. 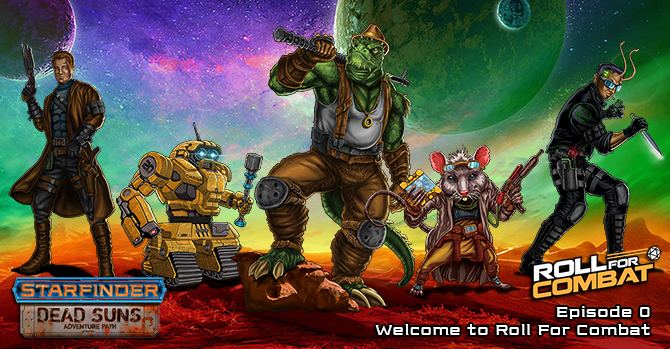 And somehow, it just amused me to have all of this coming out of a three-foot-tall rat, though ysoki do make a natural racial choice for a mechanic. As far as calling the drone C.H.D.R.R. – that’s all me. I try to be genuinely clever (I grew up in a house where Monty Python was required viewing), but sometimes I take the low-hanging fruit of Dad Jokes, quotes from Anchorman, and dropping “that’s what she said” jokes into conversations. You’d better get used to it. I realize the first episode is a bit heavy on the book-keeping, but I’d love to hear your feedback, whether it’s the topics I’ve been talking about here, or something else in the podcast that may have captured your interest. Feel free to jump in and join the conversation. The “Big Podcast Launch Giveaway” With Over $1000 in Prizes! 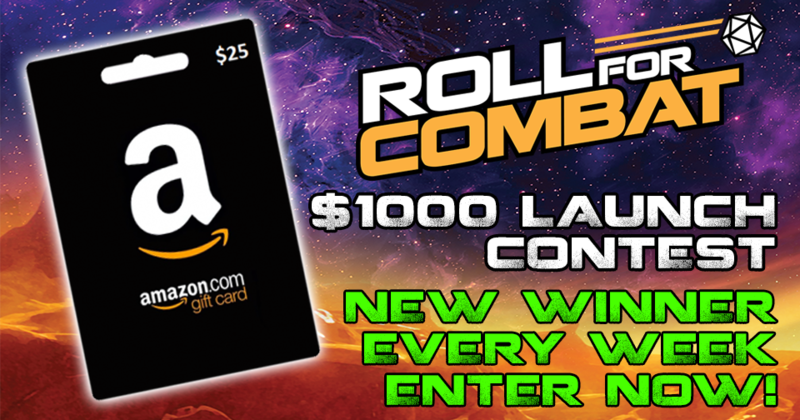 We here at Roll For Combat are extremely excited about our new podcast and to celebrate our launch we want to start it off in a big way with over $1000 in prizes. PLUS a special bonus prize for every single person who enters! Grand Prize when the contest ends: A $250 Amazon gift-card so you can buy as many RPG books as you want, plus a custom Roll For Combat t-shirt designed just for you! 1st Prize: A $100 Amazon gift-card, plus a custom Roll For Combat t-shirt designed just for you! 2nd Prize: A $50 Amazon gift-card, plus a custom Roll For Combat t-shirt designed just for you! 3rd Prize: A $25 Amazon gift-card, plus a custom Roll For Combat t-shirt designed just for you! EVERY SINGLE WEEK: A $25 Amazon gift-card will be given out after EVERY show EVERY week. So don’t delay entering as you can win as early as next week! Plus for everyone who enters: When the contest ends you’ll be sent custom RPG content created specifically for the show and for use in your RPG campaign. 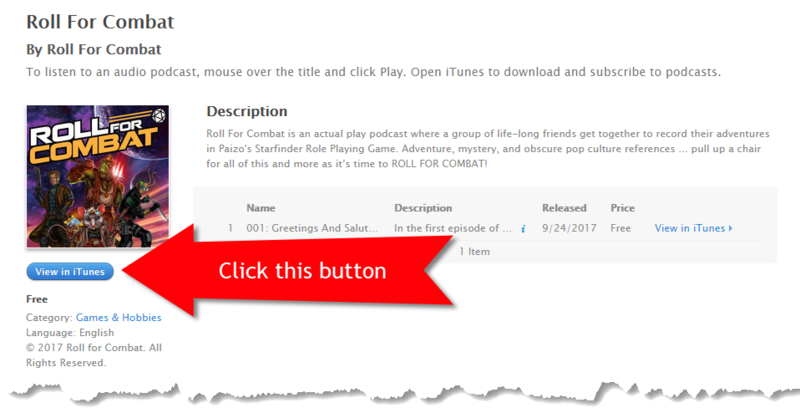 1) Click this link to go to the iTunes podcast page for Roll For Combat. 5) Click on “Ratings and Reviews” and then click the “Write a Review” button below it. 6) A pop up window will appear where you can now leave a simple, honest review about my podcast. You just need to give it a simple title, leave a short text review, give it a rating from 1 to 5 (with 5 stars being the best), and then click “Submit”! After that just listen to the show each week where we’ll draw a random name from the entries and if your name is called, you won! Just contact us after the show and claim your prize! For Android users follow the same general instructions as above, only write and post your review in Stitcher instead. 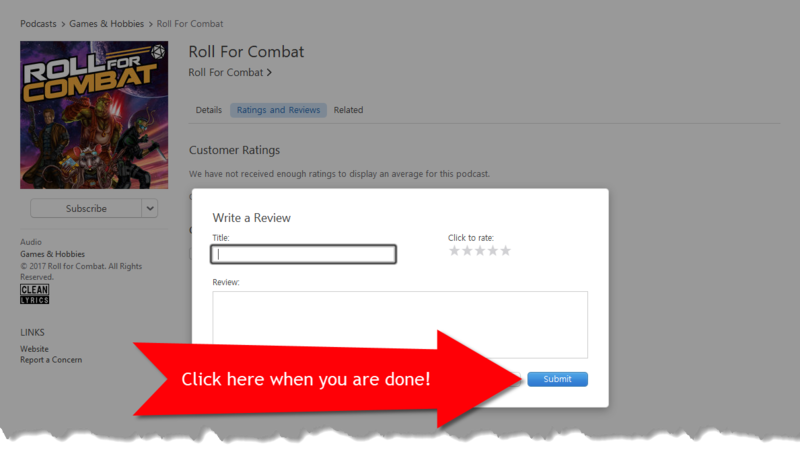 Simply load the Roll For Combat page, scroll down, and write your review. Then submit your entry and you’ll be all set! Note: Don’t worry, we won’t resell your email or do anything with it, and all prizes must be claimed no later than December 31, 2017. Good luck! In the first episode of Roll For Combat, we meet GM Stephen and our intrepid crew – the reptilian ruffian Mo Dupinsky; the trophy-hunting Lashunta Hirogi; the self-proclaimed brains of the operation, Tuttle Blacktail, and the uncomfortably good-looking Rusty Carter. 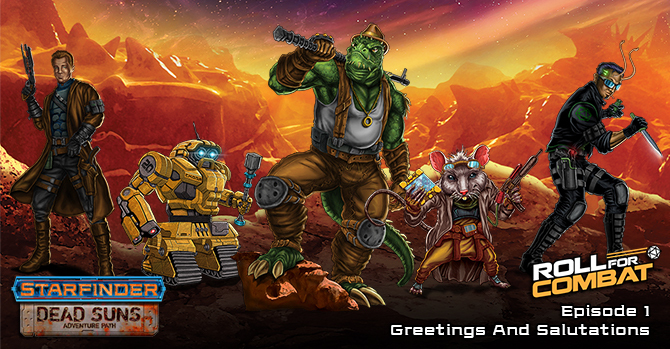 We begin with introductions, chat about the new Starfinder universe, and then finally get to learn about Absalom Station and the Starfinder Society with our Very Special Guest Thurston Hillman from Paizo as our tour guide. Also, make sure to check out the “Big Podcast Launch Giveaway” with over $1000 in prizes! And don’t forget to become a supporter of the podcast at our Patreon page: https://www.patreon.com/rollforcombat where you can help us while unlocking fun exclusive rewards for yourself! This episode will give you a quick rundown of what our show is, what to expect on each show, how our show is different from other “actual play” podcasts out there, and where you can jump right into the action. Whether you are brand new to the show or a long-time listener, you’ll learn everything you need to know about how to best experience our podcast and what to expect each week! If you enjoyed this episode, don’t forget to subscribe to the podcast. We would also love it if you would leave us a review on iTunes! Stephen Glicker (The GM) first got into tabletop gaming after getting the Dungeons & Dragons “blue box” edition … which was so old it didn’t even come with dice! Instead, there was a piece of laminated paper with numbers ranging from 1 to 20. The player was instructed to carefully cut out the number chits, put them into a cup and whatever number was pulled from the cup was your “roll”. Despite this poor excuse for a d20, Stephen was instantly hooked. 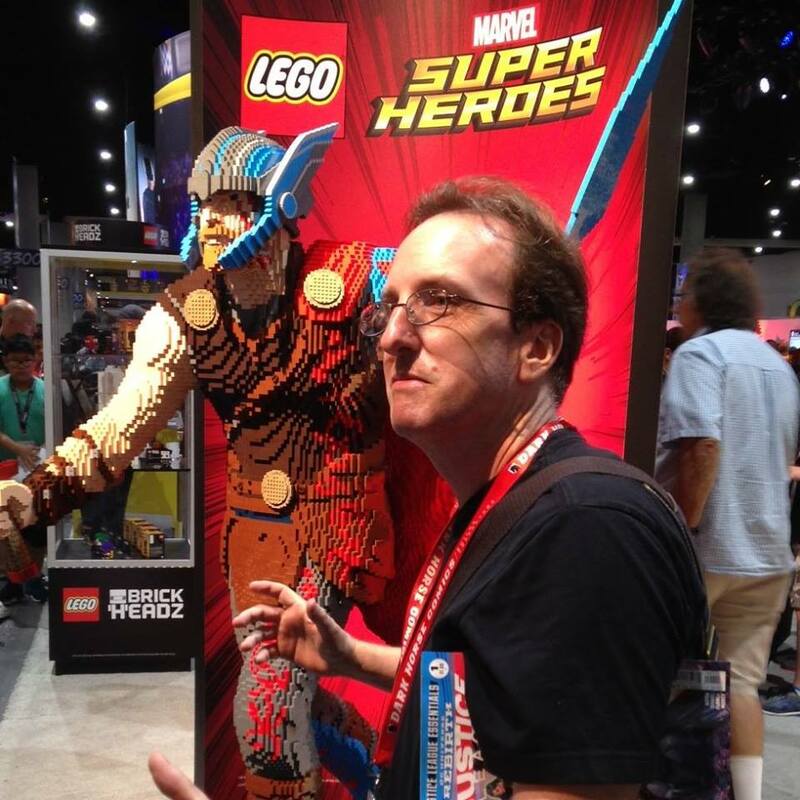 In addition to tabletop gaming, Stephen began his career in computer games when he founded his first company during high school, Creative Simulations. Stephen published his first computer game Mall Maniacs for the Apple II computer system – which he also wrote, designed, and programmed – where players had to fight to survive in an apocalyptic future shopping mall filled with mutant creatures. It was a modest hit due to it’s “unique” premise. After attending college, Stephen started the Manhattan-based full-service digital media agency SuperNova Productions. This award-winning, multi-million dollar company specialized in creating a large variety of projects for a wide variety of media, including web-based games, CD-ROM games, children’s games, cell phone games, and games for museums and galleries. Stephen has worked with some of the largest licenses in the world including Harry Potter, The Lion King, and Blue’s Clues, as well as many others. Jason McDonald (Tuttle Blacktail) first got into tabletop gaming in his early teens with friends from his local neighborhood in Pittsburgh, PA – mostly Dungeons and Dragons and Top Secret, but after a few beers, he might admit to having played a session or two of Boot Hill. As childhood gave way to college and beyond, tabletop RPGs gave way to the computer variety (particularly MMORPGs and the Baldur’s Gate/Neverwinter games), leaving a trail of various characters named “Jerryx” strewn across the digital landscape. Jason’s sweet spot is cloth casters and dual-wield rogues – because if you can’t stab stuff or set it on fire, what’s the point? By day, he’s an IT guy for a local university; at night … well he was fighting crime dressed as a giant bat, but the cease-and-desist letter from DC’s lawyers kinda put a stop to that, so he went and had some kids and bought a PS4 instead. 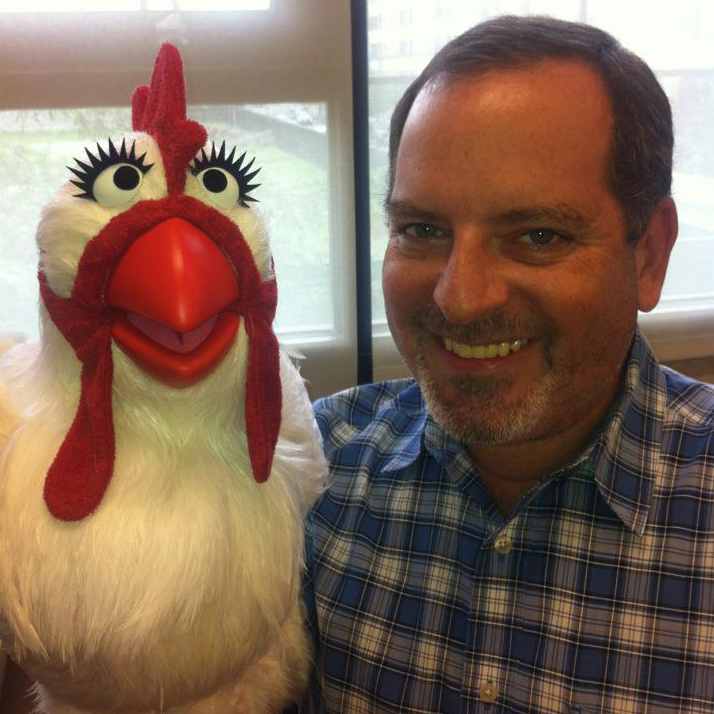 John Staats (Maurice “Mo” Dupinski) was born in raised in Akron, Ohio, and has been a roleplay gamer since 1979. 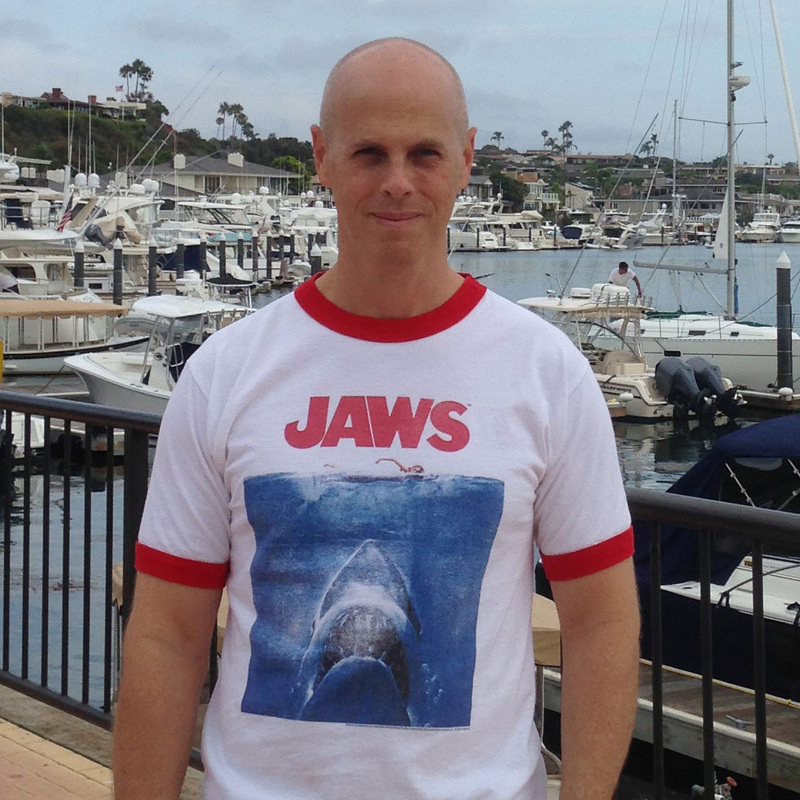 Using his art background, he’s authored over a dozen home-made adventures. 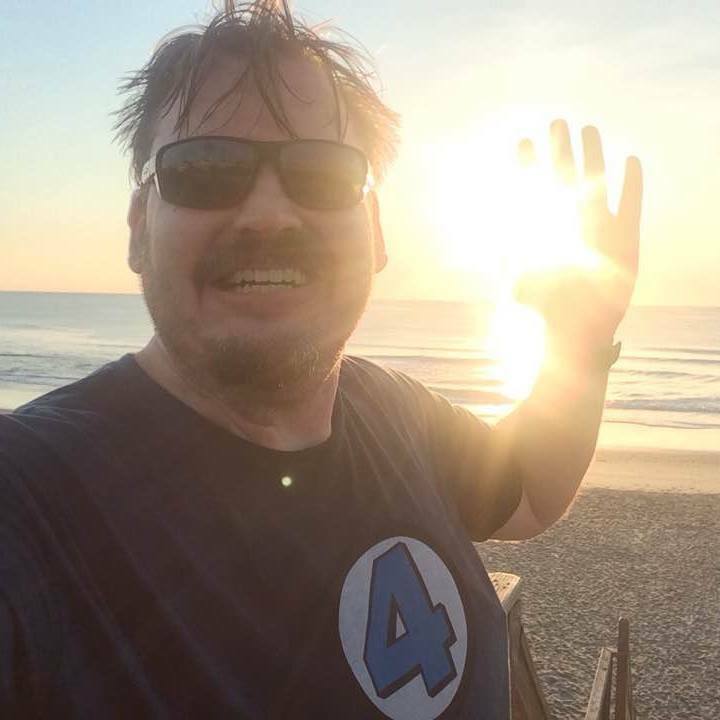 His only break from roleplaying games was, oddly, during college, when he attended Kent State’s (#1 nationally-ranked) graphic design program for four years. After school, he moved to NYC for a decade to pursue a career in design/advertising and adopted 3D level design as a hobby after discovering level editors for early FPS games. Originally, his only aspiration was to walk around in his own dungeons (which got boring quickly). He built a number of Capture the Flag levels for his Quake mod team, Loki’s Minions CTF and they earned him a job in the gaming industry, building dungeons for World of Warcraft. He built most of the game’s non-instanced dungeons and half of its instanced dungeons. After Vanilla WoW he designed dungeons for three more expansions. 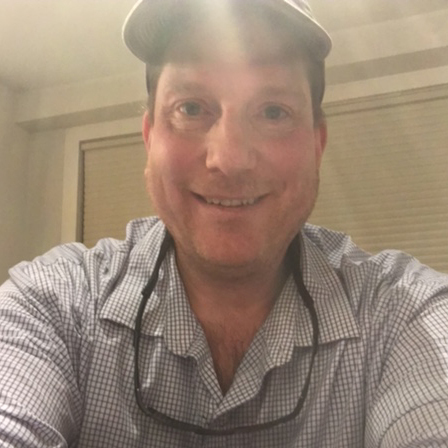 John is the author of The World of Warcraft Diary, which you can read more about at https://whenitsready.com/wowdiary/. Born and raised in Cleveland, OH, Bob Markee (Rusty Carter) was obviously very confused as a young man. Fortunately, when he was 11 or 12 his older brother brought home an original Basic Set of a new game called “Dungeons and Dragons” which seemed to make living in Cleveland a little less of a problem. Since then he’s managed to escape from the Midwest for most, though not all, of his life. Some foolish people gave him a Masters in History and then he accidentally fell into an IT career because that’s totally what people do with an M.A. in History, right? It’s really very confusing but fortunately, Mr. Markee has found out they keep updating the rules to games like that original 1970s D&D, which has made living with the chaos of his professional life a little less of a problem. Chris Beemer (Hirogi) hails from Brooklyn, New York. He’s been a lifelong gamer over the years, spanning multiple different flavors of D&D as well as some more obscure RPGs. When he’s not gaming with the Roll For Combat group, he enjoys obsessing over his Warlock in World of Warcraft, and he’s never one to turn down a game of poker. He’s also a Mets fan, though “enjoys” may be the wrong word the last few months/years/decades. Chris is also a huge fan of anything related to the Star Trek universe – anyone can have the TOS communicator sound as their ringtone, but Chris may even be willing to go to bat for Grand Nagus episodes of DS9. Don’t be surprised if we find some in-game reason to force him to sing the “Enterprise” theme song. Tuttle Blacktail – that’s DOCTOR Tuttle Blacktail to you – is a junior researcher at the Perihelion Institute of Cybernetics on Verces. Tuttle started out as a ship’s mechanic but quickly discovered he had an aptitude for computer systems, at which point he turned his eye to the world of academia to further his training. Years later, after achieving his doctorate (a fact he is sometimes obnoxiously proud of), Tuttle took a junior position at Perihelion, but his projects tended to be on the low end of the priority list due to his unconventional ideas and general lack of people skills. As a result, Tuttle has recently returned to his early spacefaring ways to help secure his own funding for his research. Tuttle’s most recent creation is the Cybernetic Hybrid Dynamic Response Rover (C.H.D.R.R.) to assist him in his travels, both to serve as his bodyguard and to field-test some of his more advanced AI designs (two birds, one stone! ), a design which he is constantly fine-tuning.